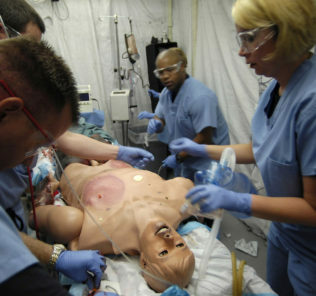 The United States Air Force Air Education and Training Command at the Brooke Army Medical Center U.S. trains like no other, with a unique simulated environment system called the Wide Area Virtual Environment, or WAVE. 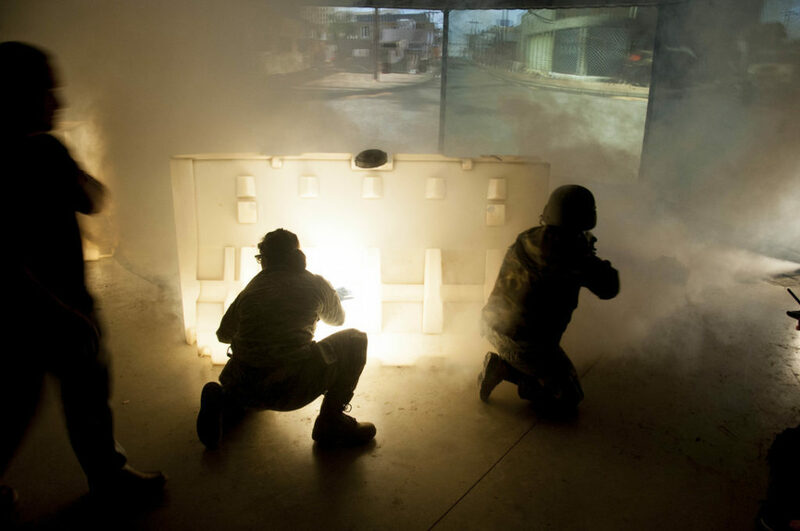 Building environments that create blended learning, service members can simulate healthcare engagements “on the move” between multiple patient scenario surroundings, all while responding to threats in real time. In the video below the Camp Bullis Medical Simulation Team develops #WarriorMedics by using the ‘WAVE’ to create a simulated battlefield scenario where medics first engage the enemy and then attend to the wounded. This method of instruction plays a vital role for their mission in global responsiveness. With development supported by the US Army Medical Research Acquisition Activity through the Virtual Medical Environments Laboratory (VME) at the Val G. Hemming Simulation Center, the WAVE represents a unique training platform for the U.S. Military. Many computer based medical simulators focus on individual skills training. However, medical care is frequently rendered by teams. In addition, the conditions under which care is provided can be a crucial factor in training. For example, mass-casualty events can involve the management and triage of large numbers of victims under austere environments. Learning to care for the injured warfighter during combat requires realistic simulation of battlefield conditions. Current simulation systems do not adequately address team training requirements within lifelike environments. The Wide Area Virtual Environment initiative aims to develop an immersive virtual environment to address these needs. Their initial prototype is based on a CAVE-like system. It uses three vertical screens to display the immersive environment. An observer standing in the enclosed space perceives the illusion of being immersed in a 3D environment. To accommodate larger teams, the adjacent walls in their implementation are angled at 135°. Stereoscopic images are displayed using a paired DLP projectors with polarized filters. Users wear lightweight polarized glasses to view the scene in stereo. To handle very complex scenes at interactive frame rates, they adopt a scalable hardware configuration. Each projector is driven by a PC with hardware accelerated graphics boards. Additional improvements in display resolution and rendering capability can be obtained by tiling the display to increase the number of rendering computers used. Their system also accommodates a 5.1 channel sound system for acoustic presence. WAVE training session This approach differs from systems using computer monitors and head-mounted displays in that all members of the team are in physical proximity, yet are still able to interact within a virtual space. A scalable, network-based rendering approach permits highly complex scenes to be rendered in real-time with minimal temporal mismatch between displays. They have also developed a framework for 3D model development that simplifies the transfer of scenarios between the 3D modeling tool and the immersive environment. Work is currently underway to develop educational case content to be used in this environment. Leveraging emerging technology to train & educate #Airmen is a big part of ensuring #readiness to deliver 21st Century #Airpower! Check out how Joint Base San Antonio-Camp Bullis Medical Simulation Team develops 59th Medical Wing #WarriorMedics using a ‘WAVE’ to create more realistic battlefield scenarios! Learn more about the WAVE on VME’s website now!